Our finest grooming range consists of our sandalwood & clove beard oil and moustache wax. The moustache wax is designed to fit into a gentlemanâ&#x20AC;&#x2122;s pocket for onthe-go situations, to keep his moustache looking sharp at all times. The team at Pall Mall Barbers have over 350 yearsâ&#x20AC;&#x2122; combined knowledge of the trade. The service menu provides a full description of what to expect when you visit Pall Mall Barbers. From our extensive experience, we have designed a service menu that ensures you receive a high quality service from start to finish, leaving our shop feeling great and looking sharp. Our highly trained and experienced barbers begin with a thorough consultation before your haircut starts. The Pall Mall Barbers App has arrived! Hate making phone calls, or need to book your next appointment on the go? 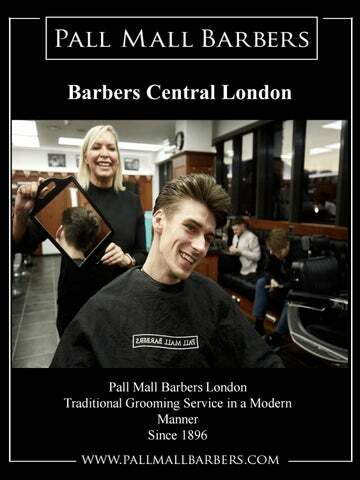 Then the Pall Mall Barbers app is perfect for you. 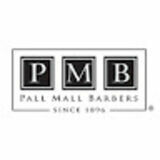 The Pall Mall Barbers app makes it easier to see all of the information about your nearest barbers, including the opening times, which barbers work at the store and the services on offer at each location. Pall Mall Barbers london is located on a historic site at 27 Whitcomb Street, near Trafalgar Square. Itâ&#x20AC;&#x2122;s a narrow street that extends from Pall Mall to Leicester Square to Coventry Street. The street developed from an ancient highway known as Colman Hedge Lane, which ran from Tyburn Road (now Oxford Street) in the north to the Old Royal Mews, or stables, which stood near the bottom of the lane until they were burned down in 1534. It is now the site of the National Gallery. Finest quality men's razors, shaving brushes and grooming products. We have delivered the finest menâ&#x20AC;&#x2122;s products in London since 1896. Now it is your chance to take the Pall Mall Barbers experience home with you and bring our superb selection of hair styling, beard & shaving products to your bathroom.